We, the scholars of Marquette University, recognize the importance of personal integrity in all aspects of life and work. We commit ourselves to truthfulness, honor, and responsibility by which we earn the respect of others. We support the development of good character in our academic community, and commit to uphold the highest standards of academic integrity as an important aspect of personal integrity. Our commitment obliges us as students, faculty, and staff to conduct ourselves according to the Marquette University Honor Code set forth below. We do this in pursuit of Marquette University’s mission, which is the search for truth, the discovery and sharing of knowledge, the fostering of personal and professional excellence, the promotion of a life of faith, and the development of leadership expressed in service to others. To turn in work done specifically for the paper or assignment, and not to borrow work either from other students, or from assignments for other courses. To give full and proper credit to sources and references, and to acknowledge the contributions and ideas of others relevant to academic work. To complete individual assignments individually, and neither to accept nor give unauthorized help. To monitor and design exams and assignments so that honest students will not be disadvantaged by other students who might choose to cheat if given the opportunity. To give full and proper credit to sources and references, and to acknowledge the contributions and ideas of others relevant to research. To conduct research experiments according to professional standards of objectivity conscientiousness, reliability and transparency. To conduct all experiments according to professional ethical standards, and, when applicable, to submit all proposed investigations to the relevant oversight bodies. To observe all duties required by copyright and patent regulations. To follow through on reporting, punishment, and record-keeping on all incidents of personal and academic misconduct. As students we strive to come to class on time and to be prepared for the material at hand. This includes all readings and assignments. We strive to devote our full attention to the class proceedings and to be fully engaged in class discussions and activities. We recognize the importance of asking questions about material we don’t understand, as it helps other students who may not have thought of the question but need to hear the answer, and it gives the instructor valuable feedback. We respect the views of classmates and instructors, and we avoid distracting the class and instructor with irrelevant conversations or behavior. We strive to prepare for exams in a timely manner, and to seek help from the instructor when necessary during the preparation. We start preparing papers, projects, and homework assignments early enough to have sufficient time to do the best we can. As instructors we strive to be prepared and current with respect to the content and conduct of our courses, and to plan the course and class sessions to achieve the course objectives effectively. We strive to answer questions honestly and completely, and to acknowledge when we do not have an answer. We strive to give all students equal opportunity to participate in class discussions and activities. We respect students’ views on issues of judgment, and we clearly distinguish between our personal opinions and our professional expertise. We are available during office hours or at arranged times to work with students individually to help them to master course material. We strive to develop and update exams and assignments so that they are meaningful tests of understanding and progress toward achieving course objectives. Finally, we give due and careful consideration to students’ answers and submissions when evaluating them and assigning grades. As researchers we strive to be honest, accurate, efficient, objective, and accountable in conducting and reporting our research efforts. Where applicable, we aim to publish in outlets accessible to other professionals in the field for the greatest possible dissemination of creative scholarly research. 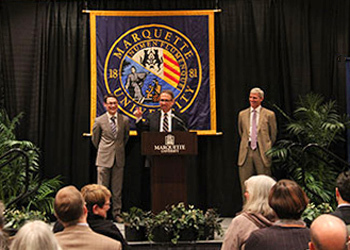 As staff we strive to serve all faculty and students within the confines of Marquette University policy and procedure. We recognize the importance of serving all faculty and students fairly and on a timely basis, while maintaining confidentiality. We respect teaching and learning, and support faculty and students in this endeavor every day.